Garden of Aaron: Why aren't the Swiss known for watering cans? Dramm 10-liter watering can action shot. 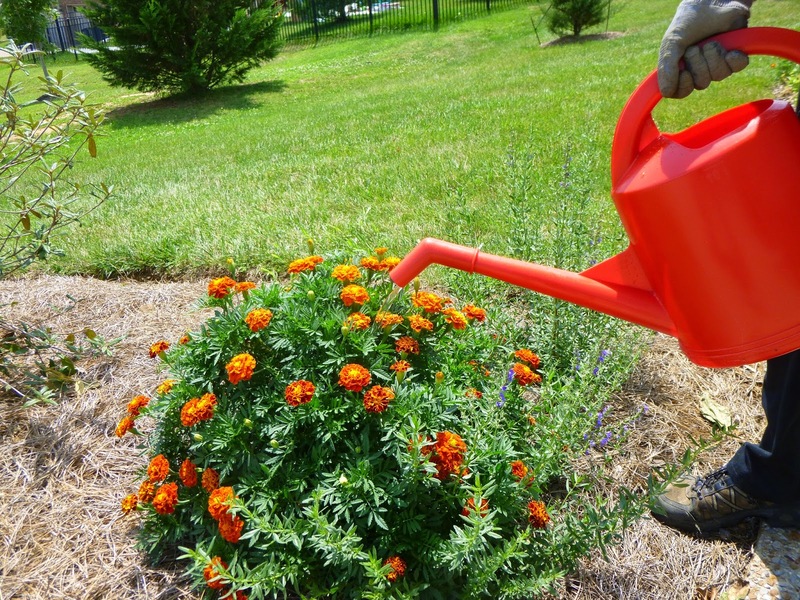 Check out those bold and beautiful French Marigolds! Made in Switzerland (! ), this watering can seems incredibly sturdy, well-made and perfectly balanced. It just feels solid. I mean, the Swiss get all the well-deserved praise for making delicious chocolates and precise timepieces, but I think they're getting shortchanged on their watering can prowess. Available in red or green colors (I recommend the cherry / fire engine red that reminds me of a red Swiss Army Knife), the 10-liter Dramm can holds over 2 gallons of water. It's true that the can does not come with a rose - the sprinkler-type attachment that often fits on the end of a watering can. In fact, Dramm does not make a rose for this 10-liter can. On the bright side, the absence of a rose means you can water these large plants more quickly without waiting forever while the water sprinkles out. (That said, I'd suggest that you still take your time and try to disburse a gentle stream of water while tilting the can so that the nozzle is relatively close to the ground. Watering with a robust stream of water from a large height is a recipe for soil compaction, runoff, splashage (technical term that I just made up) and all sorts of undesirable calamities. Full disclosure: Dramm sent me a complimentary watering can to test in the garden. In adding to the can, Dramm also sent me a complimentary solid brass adjustable hose nozzle for testing purposes. My nozzle is American-made. And shiny. And powerful. The nozzle is Made in the USA and seems darn near indestructible. Although I didn't try it, I imagine I could probably run over the nozzle with my car and that it would be no worse for wear. Since the nozzle has so few parts, it easily comes apart for cleaning should any dirt start gumming up the works. Another bonus - brass doesn't rust. In gardening as in other spheres of life, I believe it's generally a good idea to try to buy a few high-quality products rather than cheaper junk with a shorter shelf-life. Dramm's products clearly fall into that high-quality, long-life category. As for the hose nozzle, I think my expectations were misplaced or inflated. I had thought I would use it to water plants, but the stream of water emerging from the nozzle was so strong that I quickly switched back to my old leaky plastic nozzle with a wide range of adjustable settings. Looking at Dramm's website, I see that the hose nozzle is advertised for "cleaning walkways, benches and equipment." That makes sense and I think the "powerful stream" of water produced by the Dramm nozzle would be ideal for any of those purposes. 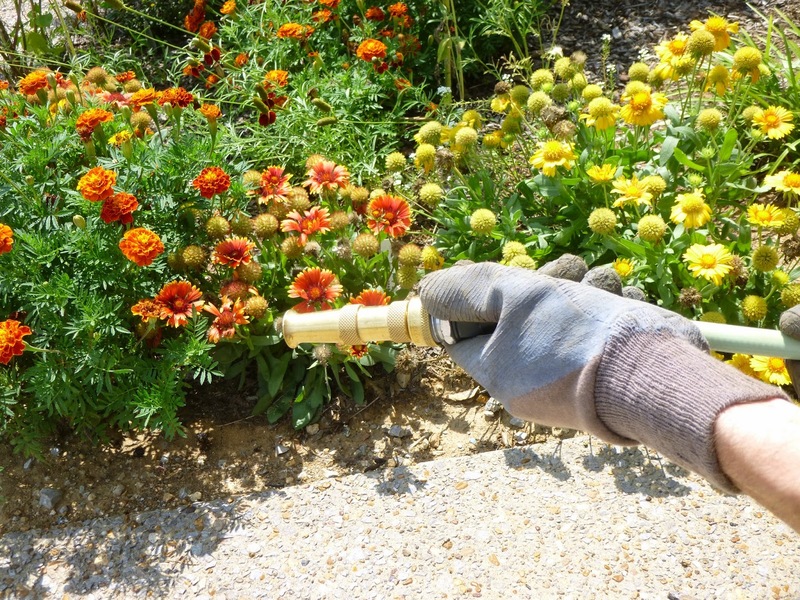 Naturally, both the Dramm 10-liter watering can and the adjustable brass hose nozzle are available via Amazon, as well as at many other online retailers and offline garden centers.